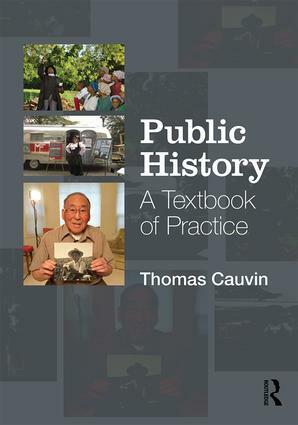 Public History: A Textbook of Practice is a guide to the many challenges historians face while teaching, learning, and practicing public history. Historians can play a dynamic and essential role in contributing to public understanding of the past, and those who work in historic preservation, in museums and archives, in government agencies, as consultants, as oral historians, or who manage crowdsourcing projects need very specific skills. This book links theory and practice and provides students and practitioners with the tools to do public history in a wide range of settings. The text engages throughout with key issues such as public participation, digital tools and media, and the internationalization of public history. Part One focuses on public history sources, and offers an overview of the creation, collection, management, and preservation of public history materials (archives, material culture, oral materials, or digital sources). Chapters cover sites and institutions such as archival repositories and museums, historic buildings and structures, and different practices such as collection management, preservation (archives, objects, sounds, moving images, buildings, sites, and landscape), oral history, and genealogy. Part Two deals with the different ways in which public historians can produce historical narratives through different media (including exhibitions, film, writing, and digital tools). The last part explores the challenges and ethical issues that public historians will encounter when working with different communities and institutions. Either in public history methods courses or as a resource for practicing public historians, this book lays the groundwork for making meaningful connections between historical sources and popular audiences. This is the book we have all been waiting for: an engagingly written, single-authored introduction to Public History from an experienced teacher and practitioner. Thomas Cauvin offers readers a comprehensive overview of the field through a series of well-chosen thematic chapters, drawing on examples from across the globe. Are you asking yourself what "public history" means? For the first time Thomas Cauvin describes the complex architecture of the field. This excellent textbook anticipates where the field is going internationally. All current debates are dealt with: cultural heritage, people’s history, media, the past exhibited, digital public history, the uses of the past, teaching, civic engagement, and more. The practice of history in public is now illuminated by the author’s capacity to jump from field to theory and back. Why a Textbook on Public History? What Can Public Historians Bring to Collection Management? What Does Oral History Bring to Historical Practice? From Public Participation to the Absence of Historian? History on Screen as Public and Participatory History? How to Create an Appropriate Public History Program? Why Historians? What Sort of History? Thomas Cauvin is Assistant Professor of History at the University of Louisiana at Lafayette.